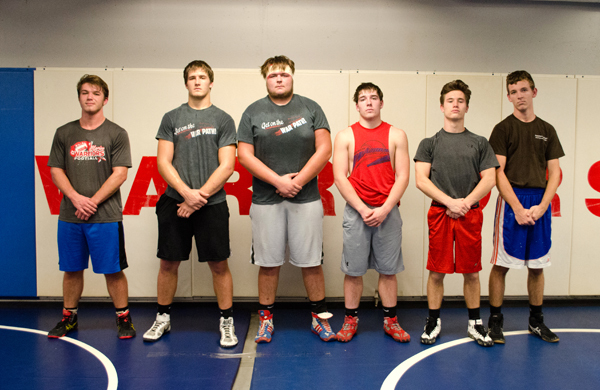 These seniors and letter-winners will bring leadership and experience to the wrestling mat this season for Marion: (from left) Charlie Nordquist, Tyler Palic, Jarret McLinden, Kolton Brewer, Ethan Darnall, Brock Mitchell. If there is strength in numbers, Marion’s wrestling team is in good shape heading into the 2017 season as the Warriors boast a 14-person roster. McMichael, too, has a year of coaching experience under his belt. He said in his first season as head coach, he learned how to better dissect instructions into simpler steps as well as communicate with parents, trends he hopes to continue this year. The Warriors lost three senior state qualifiers to graduation last year: Jarrett Johnson, Bryce Shults and Noah Albin, but six varsity wrestlers return to anchor the Warriors on the mat this season. That list begins with two returning state qualifiers. Senior Tyler Palic returns as state runner-up at 195 pounds. Ranked fifth in Class 3-2-1A, Palic won three state matches before losing to top-ranked Jacob Jen­kins from Chaparral in the finals. Jenkins, a senior, entered the match with just one loss. Palic ended the season with an overall record of 35-7. Palic is expected to wrestle at 195 again this year. Junior Charlie Nordquist is also a returning state qualifier. He went 2-2 at 182 pounds a year ago, concluding his sophomore campaign with an overall record of 27-10. He is expected to wrestle at 182 again this year. Additional returning varsity wrestlers include seniors Brock Mitchell (138, 145), Kolton Brewer (160, 170) and Jarret McLinden (285) and junior Ethan Darnall (126, 132). Brewer and McLinden were each one match from qualifying for state a year ago. Darnall wrestled at 120 pounds last year, but will move up to either 126 or 132 this season. He and Mitchell went to the same wrestling camp this summer, McMichael said. Newcomer Kyle Horton, a junior transfer from Hills­boro, also brings varsity experience, McMichael said. Horton wrestled at either 145 or 152 last year. Sophomore Calib Mallory (132, 138) competed in junior varsity action last season. Six new wrestlers have joined the team: sophomores Cooper Carpenter (170, 182), Hunter Helmer (170, 182) and Luke Lanning (195, 220); and freshmen Forest Slater (106), Will Alleven (106, 113) and Todd Palic (152, 160). “We’ve got some newcomers that are picking things up very fast,” McMichael said, adding that Alleven and Todd Palic have prior wrestling experience. “They already had a pretty good idea of the basics before they came in to practice Monday. McMichael said he does not expect to field a full varsity lineup this season, anticipating two or three open weight classes. Strengths of the team include numbers and team chemistry.